Bet Falcons over Ravens at -118 with Karamba. Bet Steelers over Chargers at -175 with 888Sport. Bet Panthers over Bucs at -185 with Karamba. Bet Eagles over Redskins at -265 with 888Sport. The NFL season is down to its final month and the sprint to the playoffs. Margins for error have been reduced and teams know they have to win the games they are supposed to win. That includes the Baltimore Ravens, who currently hold the No. 6 seed in the AFC. We’ll start with them and their matchup as we look at our favorite moneyline plays for NFL betting fans this week. The Ravens have won their last two games and have made Lamar Jackson 2-0 as a starting NFL quarterback. However, Jackson was at home for each of those games, and he will no longer be in his comfort zone. He looked shaky as a passer and that’s a big issue. It is also true that the Ravens’ last two games have been against a team which is cratering – the Cincinnati Bengals – and a team which is one of the worst in the NFL, the Oakland Raiders. The Bengals win was a three-point victory and the Raiders win was close until a late fumble-sack-recovery-touchdown. 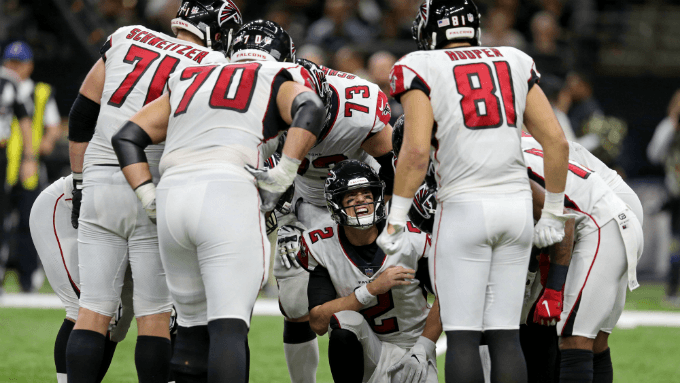 It is true that the Falcons, at 4-7, are not doing well, either, but they did just play the New Orleans Saints tough on Thanksgiving, limiting the white-hot Saint offense to just 31 points, over two touchdowns below New Orleans’ average in its previous three games (48 points). The Falcons do not appear to have given up on their season. They’ve had 10 days to prepare and are at home. Bet Atlanta -118 with Karamba. The Steelers took a bad loss last week – one that’s likely to cost them in terms of home-field advantage later in the season – but I expect them to rebound in this spot. The bottom line for Pittsburgh in the Mike Tomlin era has been a couple of key trends: The Steelers tend to play to the level of their competition (struggling against bad teams, doing well against good ones) and they tend to show up for primetime. We saw them struggle against the Denver Broncos last week – and the Jacksonville Jaguars before that – but the Steelers are still 11-6 in their last 17 against teams with a winning record. The Chargers are just 6-9. As for primetime, the Steelers are dropped a couple of primetime games this season (to Tampa Bay and Baltimore) but are 17-9 on Sunday Night Football, including 9-5 at home. This will be a close game but I like the Steelers to earn the win and get back on track. Bet Pittsburgh -175 with 888Sport. I’m slightly nervous about betting the Panthers here as they’ve lost three in a row, but I still view them as the significantly better team. Their last two losses were by a combined four points. Cam Newton is quietly in the midst of his best season and Christian McCaffrey is playing at an MVP level. The issue has been the defense. Specifically, the pass defense has allowed an average of 285 passing yards per game over their last three. They’ll give up a lot of yards again in this contest but Tampa Bay is a bad team. The Bucs are one-dimensional and they turnover the ball a lot. Jameis Winston has five touchdown passes and nine interceptions in his career against the Panthers. This will be a close game but Carolina takes it at the end of the day. Bet the Panthers -185 with Karamba. There are a number of ways to break down games but I just don’t see any way that the Eagles don’t win on Monday Night Football this week. Washington’s only wins against teams with a winning record came against Carolina (6-5) and Dallas (6-5) at home. This team has lost three of four and has been hurt badly by injuries. From losing Derrius Guice in the preseason to wideouts like Jamison Crowder and Paul Richardson midseason to starting offensive linemen, to starting quarterback Alex Smith, they are very banged up. The Eagles are not great but they at least have a talented offense and they’re at home. A win pulls them within one game of first place in the NFC East. Look for them to take care of business in primetime. Bet Philadelphia -265 with 888Sport.